It's been almost a month since the 2019 MLB schedule opened with the Mariners and Athletics in Japan. Fantasy baseball players are beginning to get a feel for their own rosters and reacting to MLB news and storylines around the league. The Rays, Padres, Mariners and Twins have been among the pleasant surprises early in the season, while the Red Sox and Rockies are among the biggest disappointments. Surprising starts should make every manager re-evaluate their own roster and the scope out the Fantasy baseball waiver wire, all while making trades to bolster their lineups. 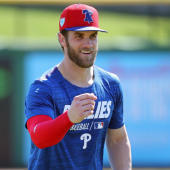 Before agreeing to any deal in your league, be sure to see Ariel Cohen's 2019 Fantasy baseball rankings and trade evaluator. This tool allows you to evaluate every prospective trade to see where the value lies and figure out how fair or lopsided it is. The Fantasy baseball trade chart can be the difference between getting fleeced or winning any trade, so it's a must-have tool for any player. Cohen is the creator of the ATC (Average Total Cost) Projection System. He was a finalist for two FSWA Awards in 2018 -- Baseball Article of the Year and Baseball Writer of the Year. Cohen and his Fantasy partner, Reuven Guy, have used the ATC system projections to finish in the money in several NFBC, RTSports, Tout Wars and other national leagues, racking up several division titles. This trade evaluator tool is extremely user-friendly. You simply download an Excel file and input the players you are giving away and receiving. The tool will then give you a value. "C" is an even deal; anything above is a win for you, and anything below is a loss. You can only access this must-have tool at SportsLine. In this week's 2019 Fantasy baseball rankings and trade chart, we can tell you that Cohen's projections are extremely high on Cubs catcher Willson Contreras. He is off to a sizzling start in the 2019 MLB season with a .318 average, six home runs and 12 RBIs. He's also fourth in the National League in slugging percentage (.773) and OPS (1.227). He was outside the top 20 on the trade chart for head-to-head Fantasy leagues last week, but has now surged up to No. 16. With a limited supply of catchers who can produce big Fantasy numbers, don't be afraid to make a move for Contreras. A player the trade chart is fading in its Fantasy baseball rankings: Red Sox southpaw Chris Sale, who has a sky-high 8.50 ERA and is 0-4 to open the season. It's a stunning development for the ace who went 12-4 last year with a 2.11 ERA and a WHIP of just 0.86. He's made it out of the sixth inning just once and has given up at least four earned runs in all but one start thus far in 2019. Sale has been rocked by left-handed hitters, who have a .500 average and .833 slugging percentage against him thus far. As a result, he's fallen from No. 41 to No. 54 on the head-to-head trade chart. It's not time to completely give up on him, but Cohen's chart indicates that pitchers like Edwin Diaz and Zack Wheeler have more value at this point in the season. The 2019 Fantasy baseball trade chart is also extremely high on a pitcher who had exploded out of the gates in 2019 to become a top-10 value after opening the season outside the top 50. Additionally, it has updated the value of players on the injured list like Blake Snell (toes), Francisco Lindor (ankle) and Luis Severino (shoulder). Getting the right value for players like these could be the difference between winning a title or going home with nothing. What are the Fantasy baseball trade values for every MLB player in head-to-head and Rotisserie leagues? And which surprising pitcher is now a top-10 value? Visit SportsLine now to see the Fantasy baseball trade evaluator and chart, all based off the projections of one of the top Fantasy baseball analysts in the nation.